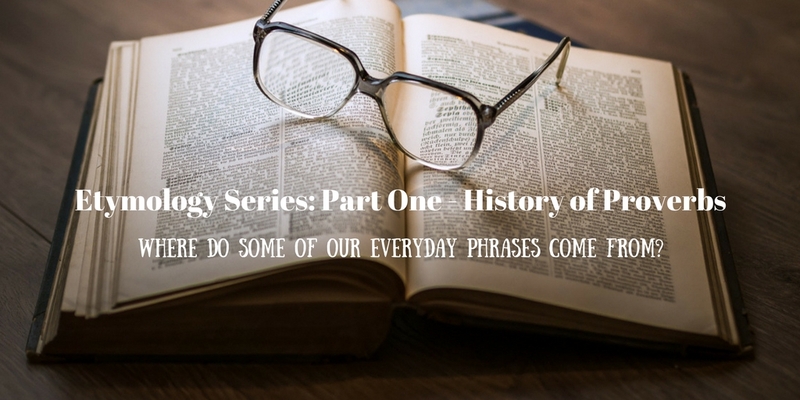 We are excited to start Part 1 of our Etymology series with a history of proverbs. Just where do they all come from? ‘Curiosity killed the cat’ is a saying most commonly used to warn someone not to ask too many questions about something or to advise that being curious can get you into trouble. However, as with a lot of old sayings these meanings change over time. Specifically, the original form of this proverb was actually “care killed the cat”, with “care” meaning worry or sorrow. It is believed that this term was coined in the 1598 play ‘Every Man in His Humour’. The origin of the modern version is unknown, however, the earliest known reference to it was in James Allan Mair’s 1873 ‘A Handbook of Proverbs…’: where it is listed as an Irish proverb. Another, extended version of this saying is “curiosity killed the cat but satisfaction brought it back” which came about later and indicates that sometimes risk is a good thing and that being inquisitive is sometimes the only way to get an answer. This version is believed to date back to 1905, where it was printed in a newspaper as “curiosity killed the cat, but it came back”. Then in 1912, the full version was printed in The Titusville Herald newspaper. Nowadays, this phrase is used to imply that family relationships are more important than friendships, often suggesting that family should be prioritised. However, the full quote is actually “the blood of the covenant is thicker than the water of the womb”, which has the exact opposite meaning. The original meaning actually doesn’t refer to family at all and instead comes from the idea that a bond made with someone that you’ve shed blood with (in the past this would have been a literal reference to battle) is stronger than one had with someone you’ve shared the womb with. The first reference to anything similar to this was 1180 in ‘Reynard the Fox’ by Heinrich der Glîchezære and was written as “Kin-blood is not spoilt by water.” The form “blood is thicker than water” appeared in 1670 in John Ray’s work ‘Proverbs’ although the ‘invention’ of the phrase is credited to Sir Walter Scott (from his 1815 novel ‘Guy Mannering’). Truthfully the phrase has been borrowed from many places and altered throughout time. Often used in a joking manner, “great minds think alike” is said when two people have the same opinion on something or make the same choice. It is thought to date back to 1618 where it started as “good wits doe jumpe” with “jumpe” meaning ‘agree with’. It is believed that the earliest example of this phrase in print may have appeared in Carl Theodor von Unlanski’s 1816 biography, ‘The Woful History of the Unfortunate Eudoxia’. This phrase has also been extended to “great minds think alike, fools seldom differ” or “great minds think alike, small minds rarely differ” but this expansion is believed to only be found in British English. It has been discussed that this phrase may be a take on the Chinese proverb coined by Confucius which translates to “all great heroes think alike” although there isn’t a lot of evidence to back this up. There are also Arabic versions of the phrase that were around long before the 17th century. Nowadays, usually known as ‘the proof is in the pudding’ or ‘the proof of the pudding’, the meaning of this phrase has gotten a little confused over time due to the wording. The original phrase was “the proof of the pudding is the eating” with “proof” meaning ‘test’ and therefore meaning that the real value of something can be judged only from practical experience or results and not from appearance or theory. It is argued that an early version of this proverb dates back the 14th century written as “Jt is ywrite that euery thing Hymself sheweth in the tastyng” with a more discernible version being recorded in 1605 as “All the proofe of a pudding, is in the eating”. The revised shorter versions date back to the 1920’s, becoming common in the U.S in the 1950’s. This phrase refers to someone who has tried their hand at many things rather than focusing on one skill and when first used was meant in a flattering way. However, a second clause was added later making the phrase “a jack of all trades, a master of none” which was then often used in a derogatory manner. Another positive addition to the phrasing is “Jack of all trades, master of none is oftentimes better than master of one.” These days the meaning tends to depend on the context. The earliest known recording of this phrase is in 1612. In Elizabethan English there was a quasi-new Latin term of “Johannes factotum” which translates to “Johnny do-it-all” which again had negative connotations. With the meaning that not everything that looks good from the outside truly is, variations of this phrase are believed to originate from before the 12th century (Aesop). It has also been referenced back to Chaucer’s ‘The Canon’s Yeoman Tale’ written as “But al thyng which that shyneth as the gold / Nis nat gold, as that I have herd it told” and “Hyt is not al golde that glareth” in “The House of Fame”. The popular form of the expression is a derivative of a line in William Shakespeare’s play ‘The Merchant of Venice’, which uses the word “glisters,” (a 17th-century synonym for ‘glitters’). However, today the “glitter” version of this phrase has is more commonly used. In simple terms the meaning of this expression is warning not to eliminate the good while trying to get rid of the bad. It is believed that this phrase is derived from a German proverb – “das Kind mit dem Bade ausschütten” (throw the baby out with the bath water), which was recorded in 1512, paired with an illustration of a woman dumping waste bath water into a river, along with a baby. It is believed to have appeared in English for the first time in 1849 in Thomas Carlyle’s essay on slavery in which he states “you must empty-out the bathing-tub, but not the baby along with it”, meaning you should join the struggle to end slavery but do so without causing harm to the slaves in the process. This phrase is used to mean that you shouldn’t unappreciatively question a gift. The context comes from when horses were given as gifts, and since horses’ teeth grow over time, checking their length is a way of gauging old age, and therefore a sign of mistrust towards the giver. One of the first versions of the phrase is thought to have come about in 1546 written by John Heywood as “No man ought to looke a geuen hors in the mouth” however, there is some standing given to a latin version of the phrase that can be traced back to 400 AD written as “equi donati dentes non inspiciuntur”. Taken to mean acting without conforming to the ideas of others and making independent choices. It is thought that this particular phrase was actually a misinterpretation of a line from the poem “The Road Not Taken” by Robert Frost. The line reads “two roads diverged in a wood, and I – I took the one less travelled by, and that has made all the difference”. Due to the other content of the poem it is actually reflecting on how we “reconcile our decisions over time often giving more weight to the wisdom of our decisions than was true of the original circumstances”. Although the meaning of this phrase is sometimes misunderstood or debated its usual meaning is similar to “you can’t have it both ways” or “you can’t have the best of both worlds.” The wording of the phrase can be confusing and people have argued over its illogical phrasing and it has been recorded in two alternate ways; until about 1935 the phrase was actually ordered differently, with the “eat it’ part first. An early version the phrase was found in a letter in 1538 from Thomas, Duke of Norfolk, to Thomas Cromwell, as “a man can not have his cake and eat his cake”.